In the summertime, there are so many fresh veggies in season — the side dish possibilities are endless. Tomato salad. Pickled cucumbers. Grilled corn. One of my favorite summer sides is this BLT Pasta Salad. 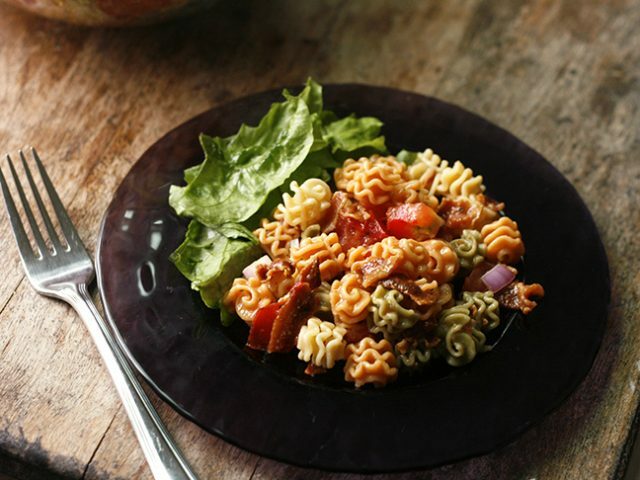 It combines juicy tomatoes, crisp lettuce, and rich bacon with a tangy vinaigrette and tender pasta for a delicious variation on the classic BLT sandwich. You can serve it as a main dish or side dish for dinner, or whip it up for a crowd-pleasing BBQ potluck dish. 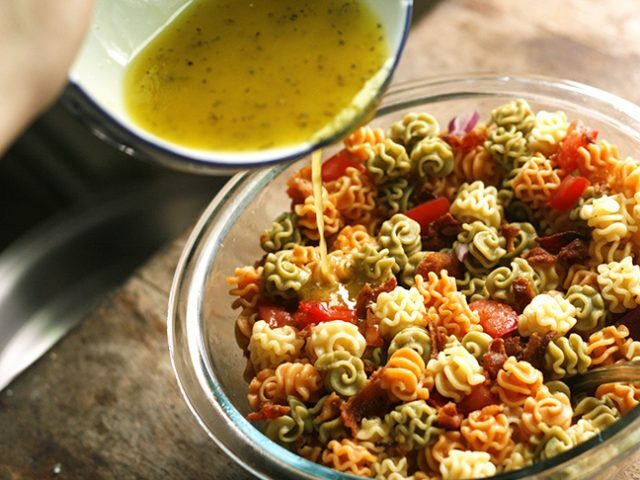 Since my kids and I are pasta salad lovers, we often pack it for picnics and beach trips. 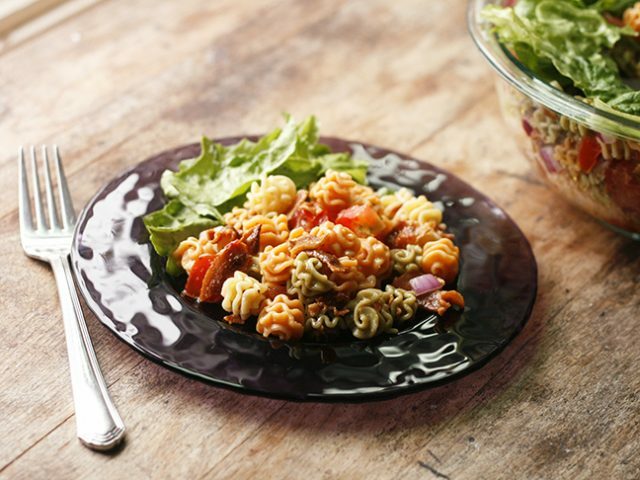 Want to try this BLT Pasta Salad? Here’s how to make it, in just a few easy steps. With rich bacon, juicy tomatoes, and a zesty vinaigrette, this summer side dish is a fresh twist on the classic BLT sandwich. Step 1: Cook the pasta according to package directions. Drain thoroughly. Step 2: In a serving bowl, stir together the pasta, crumbled bacon, diced tomato, and diced onion. Set aside. Step 3: In a small mixing bowl, whisk together the olive oil, vinegar, salt, ground mustard, garlic powder, and dried basil until thoroughly combined. 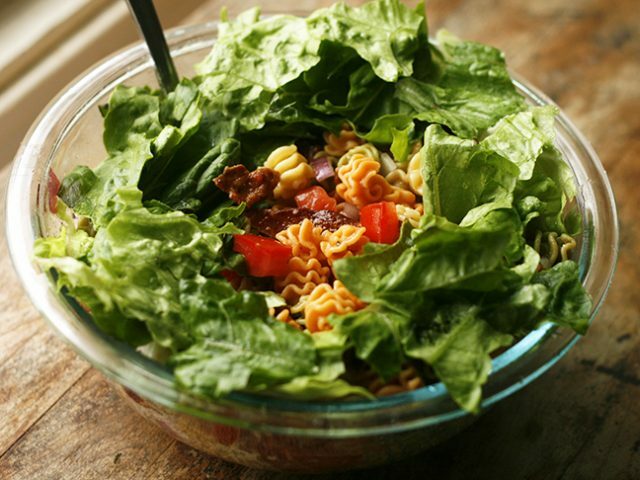 Pour into the pasta salad and toss well to combine. Step 4: Garnish with lettuce just before serving.